Once again we're at our favourite activity, painting. Today it's painting with Q-Tips (cotton buds) and I've included a Printable 1-10 Number Template if you'd like to include some number learning. 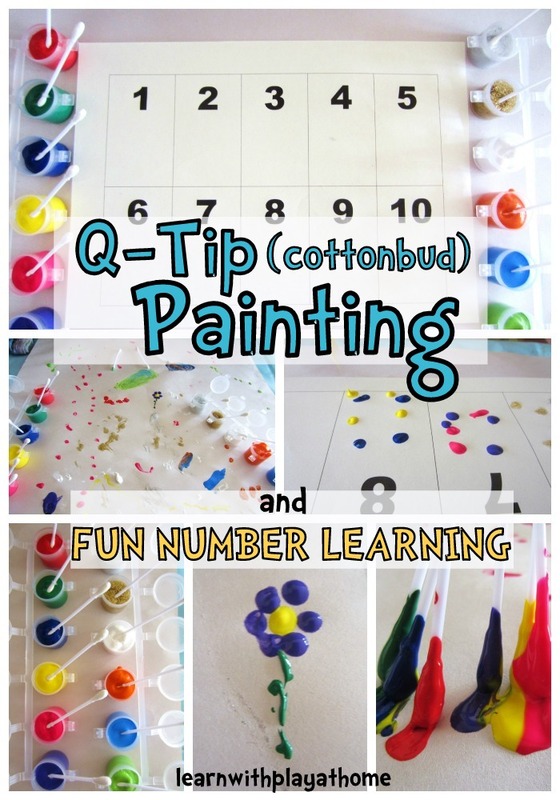 Materials: Paints, Q-tips (cotton buds), Paper and a copy of THIS number template if you'd like to include extra learning. With your child, identify and count each of the written numbers. Have your child place the corresponding amount of dots in each square. Encourage your child to use whatever colours they like but ensure that each time they change colours, they re-count the dots they've already done and then count-on from there to add the remaining dots. This entire picture had a running dialogue. From animals walking around to waterholes and jungles (Can't you tell?). Story telling through painting can be so therapeutic. Look at the patterns and colours. - Mix it up by making a garden picture and having each of the petals done with a q-tip. Each flower could have a different number of petals for the child to count and paint. - Remember that sometimes children just create, they don't need it to be a specific item at the end. It could just be an abstract creation. Allow this and don't push them to think they must paint something "real." Super cute idea! Love all the variations! lovely! such a fun activity! This is how we always have to paint, because my daughter freaks out if she gets paint on her hand. I love the numbers sheet. That will be perfect for preschool! I love painting with q-tips. It is a lot less messy than the paint brushes. We made a rainbow with ours. Thanks for sharing! What a brilliant idea. I did a post for teaching the letter P on different ways to paint and this is not a way I'd thought of. We are going to have to do this! My daughter loves to paint and loves q-tips lol! We haven't painted with those in ages, and I remember they liked it too. I am definitely going to try with the numbers! Thank you! Hope it's ok to pin this. So fun! Thanks for sharing! Pinned it and plan on doing this soon. Cute idea! My kids love painting with q-tips!